There is no winter vacation anywhere else quite like the one you will receive in Alaska. Winter is the Alaskan season that offers its visitors a truly memorable experience. At the top of the Alaskan list of activities to engage in are dog mushing and dog sledding. Dog mushing and dog sledding are age-old means of transportation, sport and fun in Alaska. The famed Iditarod event held in Alaska showcases the beautiful Huskies and their impressive strength to pull their owner through the crisp and crunchy snow-filled fields. 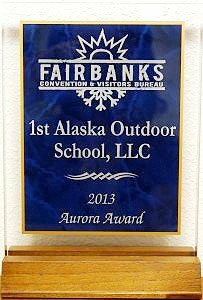 1st Alaska Outdoor School provides guided dog mushing and dog sledding tours. This fascinating adventure portrays the wintry beauty of Alaskan landscape as well as provide admiration for the featured four-legged friends and their amazing sledding power. We cover a vast area on the tour and we don’t put a restriction on time. You cannot get the complete effect unless you are fully engaged in the dog sledding experience. Provided with each mushing and sledding tour are parka, pants, boots and mittens. All participants are introduced to the dogs as well as become aquatinted with the sled which you will be riding on. The actual mushing throughout the trails are trails that actual dog mushers use. This is such an exhilarating experience and we delight in sharing our passion for this adrenaline rush with you. For guided dog mushing and dog sledding tour information, be sure to contact 1st Alaska Outdoor School today. If a visit to Alaska during the winter months is your goal, don’t miss out on this wonderful experience.